The conference last weekend went really well, I got quizzed after my paper by some high profile people in the field, who had taken notes throughout my session, and continued to do so while I was trying to eat lunch and explain some of my points in greater detail. I also got a good look around Cambridge. I saw pretty much the ugliest church I’ve ever seen. I also got look in the Fitzwilliam Museum, some cool stuff but it has this really strange mix of up-to-date and more antiquarian displays. The Near Eastern (all Babylonian, Assyrian etc) but very little Achaemenid or later material. The Greek pottery was very good, displayed well (you seen both sides of most vases) but was very old fashioned. I guess I was a little surprised but it was good see. Disappointingly I couldn’t find any books in the museum shop (or any second book shops while I was there). I did go to the CUP bookshop but everything is so expensive! The weird thing I saw, of all things, were the hand dryers in the washrooms at John Lewis. 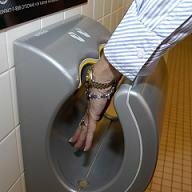 Apparently Dyson do hand dryers now. They were very odd, efficient, but odd. Kind of like sticking your hand into a food disposal unit. I had my last class on wednesday and while I’m glad that its all done (I have enough other stuff to get on with) it has been an interesting (and steep) learning curve. The class, as a group, have been good – they ask questions, they want to share opinions, pictures, thoughts – we rounded off the last class with a half hour discussion on points that they found interesting throughout the course which seemed to go down a lot better than I had been expecting. More interestingly, after the first couple of classes they seemed to accept that I did know what I was talking about. Teaching groups of totally mature students when you are only in your mid-twenties is difficult. Especially as they can (and have, in my previous experience) be very dismissive of younger lecturers. In terms of benefits to me, I learnt how to deal with on the spot questions better (in other words, when they reach the end of the question – I can still remember it), as well as learning how to prep 2 hour lectures in a short as time as possible. My second year classics group unfortunately, although thankfully they aren’t due for another couple of weeks. I feel better about not doing anything with them as the notes for marking only came through a few days ago… despite the fact that these were handed in about 2 weeks ago. Hurrah, the F1 season is back on. The race last weekend at Melbourne was dramatic, and the qualifying today was cool, some interesting events (notably the blocking of Heidfeld by the Maclarens whilst he was on his hot lap & the subsequent punishment of the Maclarens)… so I’m looking forward to a good race tomorrow morning… not sure if I’ll be up at 6am to watch up – but that is what video recorders are for! Thankfully I’m on easter break now, so I have plenty of time to get on with things… speaking of which I should probably get back to work… (aka watching CSI New York)…. Order your easter eggs, and collect them later!… Beat the ques!